Wendy Mass is the author of twenty-two novels for young people, including A Mango-Shaped Space, which was awarded the Schneider Family Book Award, Leap Day, the Twice Upon a Time fairy tale series, Jeremy Fink and the Meaning of Life, Heaven Looks a Lot Like the Mall, the Willow Falls, Space Taxi and Candymakers series. Wendy wrote the storyline for an episode of the television show Monk, entitled "Mr. Monk Goes to the Theatre," which aired during the show's second season. She tells people her hobbies are hiking and photography, but really they're collecting candy bar wrappers and searching for buried treasure with her metal detector. Wendy lives with her family in New Jersey. To ask Wendy Mass questions, please sign up. Hello, are there any new books that you are working on? I LOVED your Twice Upon a Time series and I hope another book will be released from these series, are there? Thank you so much! 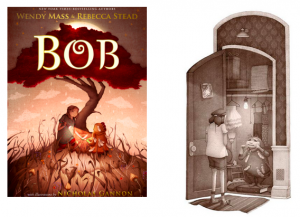 Wendy Mass voted for Bob as Best Middle Grade & Children's in the Final Round of the 2018 Goodreads Choice Awards. We’d love your help. Let us know what’s wrong with this preview of A Girl Named Digit by Annabel Monaghan. We’d love your help. Let us know what’s wrong with this preview of Nothing Up My Sleeve by Diana López. What randomly selected book would you like to read in June? Thank you so much for becoming my friend! Your books really helped and inspired me so much as a kid. I am so honored to be one of your 75 friends here on goodreads. I'm not sure why you sent me a friend request, but you are a very important person in my life. You changed my daughter's life. I honestly believe that your books have helped her become the amazing woman she is today. She fell in love with you before I did, and I will be forever grateful for what you have given us.